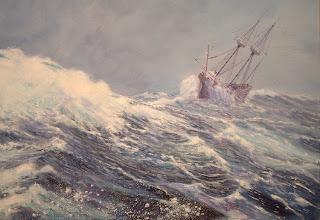 I heard a story of some men years ago who were on a leaky old ship, in the middle of a rough and stormy sea. And they were actually fearful for their lives. They didn't know whether they were going to sink or not. So one of them went in to see the captain and said, "Captain, are we safe?" He said, "Well, I'll put it to you this way." He said, "The boilers on this ship are very weak and may explode at any moment." He said, "Also, the ship is very old, and she's taking on water." So he said, "To be very honest with you, we may have an explosion, or we may sink." He said, "We may go up, or we may go down, but at any rate, we are going on." And that's the way we are as we face this New Year. Jesus may come, we may go up. We may die, and go down and then up, but at any rate we are going on. We're going on. We're facing a brand new year, and we don't know what it's going to bring. One thing for sure is we need to trust in God. 5-6 Don't be obsessed with getting more material things. Be relaxed with what you have. Since God assured us, "I'll never let you down, never walk off and leave you," we can boldly quote, God is there, ready to help; I'm fearless no matter what. Who or what can get to me? Dear Lord we pray that as we get ready for the New Year that we would put our trust in you, knowing that you will not leave us. In Jesus’ name, Amen.